Around St. Patrick's Day, you start to see lots of three-leaf plants, or shamrocks, on flags, posters and holiday decorations. But did you ever wonder what the shamrock symbol means? 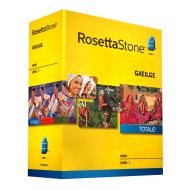 It actually has a long and interesting history in Irish culture. The shamrock has been sacred in Ireland since ancient times. The first inhabitants of Ireland, the Celts, revered it because of its three leaves. The number three was an important number to them and to many other ancient cultures. Three can represent the elements, like water, air, and earth; or time - past, present, future. 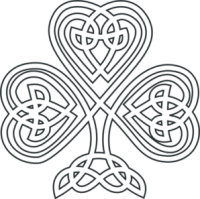 Old Celtic monuments were often decorated with a symbol created from three spirals, called a triskelion. 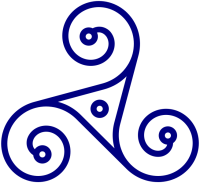 A triskelion looks like a very basic shamrock symbol. When St. Patrick came to Ireland in the fifth century to convert the heathen Celts to Christianity, legend says he used a shamrock to explain the nature of the trinity. The three leaves made up a single shamrock, just as the Father, Son and Holy Spirit make up the trinity. St. Patrick was very smart to use the shamrock this way, because it provided a link between the Celts' old religion and this new one. 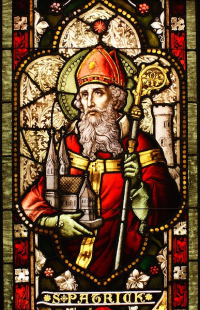 Over the years, rumors grew up around St. Patrick that may or may not be true. It was said that he banished the snakes from Ireland, and in fact there are no snakes there today. Snakes, says the rumor, hate shamrocks, and shamrocks can be used to treat snakebite. People also claimed that wherever Patrick preached and converted people, shamrocks would grow. In the 19th century, the shamrock - originally "seamróg" in old Irish - came to symbolize everything Irish. When England's Queen Victoria tried to rule over Ireland, wearing a shamrock turned into a symbol of rebellion against oppression. The Irish called putting a shamrock on your clothing "the wearin' o' the green," and it came to represent Irish pride. The shamrock began to appear everywhere, on military flags, on greeting cards, and in artwork, especially the art of Celtic Knotwork. What is the Shamrock Plant? There is much controversy about which plant is technically a "shamrock." Some authorities think it's the wood sorrel, or oxalis acetosella, which grows throughout Europe and has bright green, three-part leaves and small flowers. Wood sorrel is edible, and since the English often used to describe the Irish eating their shamrock plants, this argument would make sense. Today, you can buy a related plant, oxalis triangularis, in garden stores. Other experts claim that the shamrock is actually just the common trefoil, or trifolium dubium. Trifolium dubium is found all over the world, including Ireland, and it is often thought of as a weed. But its attractive yellow flowers and pretty green leaves make it an ideal plant for home growing. 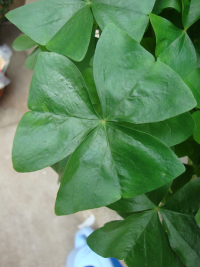 With just a few trefoil or shamrock seeds, you can have genuine shamrock plants in your own yard!